The used auto part source you'll be returning to for years. 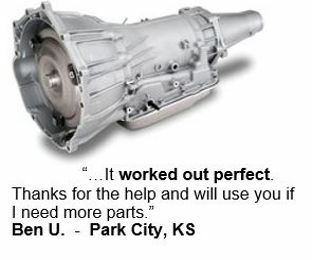 Let us help you find the best part for the best price! Our team of parts experts have been helping people find exactly the part they need at the best price since 1997. We're in this for the long haul - we're not going anywhere. We've very pleased to say our customers send us emails calling us "trusted, professional and knowledgeable." Are you looking for someone to help you figure out which part is the best deal? Don't let the dealership talk you into expensive new parts. 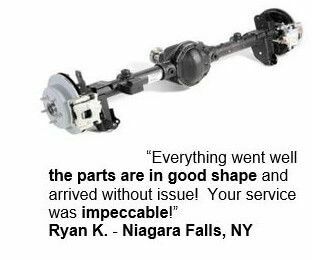 We can help you find the same part for your car at a MUCH better price! We have hundreds of thousands of top quality, low mileage parts that have been run, tested and pass strict quality checks. We're good people. 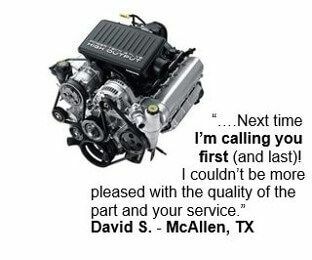 Give us a call - you'll be talking to a courteous, knowledgeable, patient Parts Expert who will take the time to make sure you're getting the best part at the best price. You don't have to go it alone. Let us help. We'd absolutely love to help you find the best part for your hard-earned money. We've been in business since 1997 doing one thing and one thing only - helping people find top quality used auto parts at great prices. It's our passion. Let us help you too! Just grab the phone and call one of our highly trained and always courteous Parts Experts at 1 - (866) - 411 - 1101. We are standing by to help you find the best deal! We offer exceptional quality, unbeatable warranties and generous return policies on all our parts for your car or truck. Give us a call today.